Will 2-D tin be the next super material? A single layer of tin atoms could be the world's first material to conduct electricity with 100 percent efficiency at the temperatures that computer chips operate, according to a team of theoretical physicists led by researchers from the U.S. Department of Energy's (DOE) SLAC National Accelerator Laboratory and Stanford University. 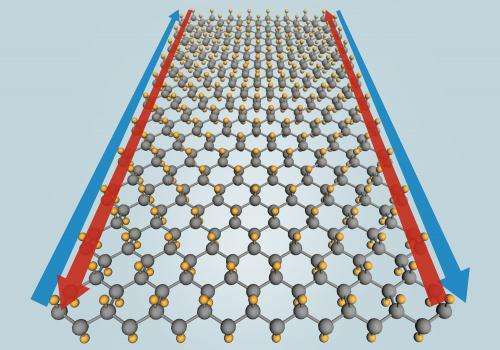 Researchers call the new material "stanene," combining the Latin name for tin (stannum) with the suffix used in graphene, another single-layer material whose novel electrical properties hold promise for a wide range of applications. "Stanene could increase the speed and lower the power needs of future generations of computer chips, if our prediction is confirmed by experiments that are underway in several laboratories around the world," said the team leader, Shoucheng Zhang, a physics professor at Stanford and the Stanford Institute for Materials and Energy Sciences (SIMES), a joint institute with SLAC. The team's work was published recently in Physical Review Letters. For the past decade, Zhang and colleagues have been calculating and predicting the electronic properties of a special class of materials known as topological insulators, which conduct electricity only on their outside edges or surfaces and not through their interiors. When topological insulators are just one atom thick, their edges conduct electricity with 100 percent efficiency. These unusual properties result from complex interactions between the electrons and nuclei of heavy atoms in the materials. "The magic of topological insulators is that by their very nature, they force electrons to move in defined lanes without any speed limit, like the German autobahn," Zhang said. "As long as they're on the freeway – the edges or surfaces – the electrons will travel without resistance." In 2006 and 2009, Zhang's group predicted that mercury telluride and several combinations of bismuth, antimony, selenium and tellurium should be topological insulators, and they were soon proven right in experiments performed by others. But none of those materials is a perfect conductor of electricity at room temperature, limiting their potential for commercial applications. Earlier this year, visiting scientist Yong Xu, who is now at Tsinghua University in Beijing, collaborated with Zhang's group to consider the properties of a single layer of pure tin. "We knew we should be looking at elements in the lower-right portion of the periodic table," Xu said. "All previous topological insulators have involved the heavy and electron-rich elements located there." 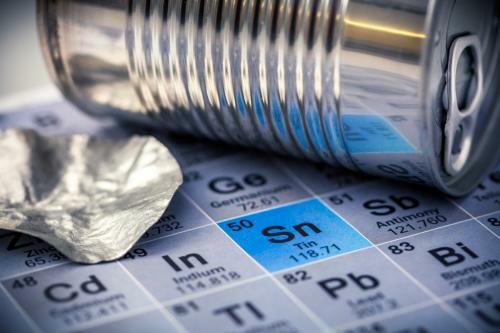 Their calculations indicated that a single layer of tin would be a topological insulator at and above room temperature, and that adding fluorine atoms to the tin would extend its operating range to at least 100 degrees Celsius (212 degrees Fahrenheit). Ultimately a Substitute for Silicon? Zhang said the first application for this stanene-fluorine combination could be in wiring that connects the many sections of a microprocessor, allowing electrons to flow as freely as cars on a highway. Traffic congestion would still occur at on- and off-ramps made of conventional conductors, he said. But stanene wiring should significantly reduce the power consumption and heat production of microprocessors. Manufacturing challenges include ensuring that only a single layer of tin is deposited and keeping that single layer intact during high-temperature chip-making processes. "Eventually, we can imagine stanene being used for many more circuit structures, including replacing silicon in the hearts of transistors," Zhang said. "Someday we might even call this area Tin Valley rather than Silicon Valley."